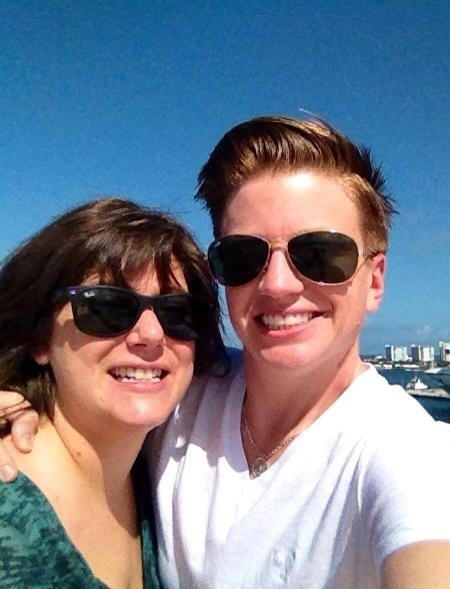 There is nothing, I repeat, NOTHING funny about a dyke with a bad haircut (okay, so it’s sort of a little funny…). There are many butches out there with long hair. Short hair is not requirement for being butch. In fact, nothing is. But let’s face it, there are a lot of us with short hair… maybe even a majority. If you’re a butch with long hair, this article isn’t for you. Not because I don’t respect your dapperness, or your masculinity (remember Brad Pitt in the 90s? How about Jared Leto at the Golden Globes? ), but because I know absolutely nothing about long hair. I came out at the tender age of 21 (late bloomer, to say the least), and almost immediately rushed straight to the nearest salon and chopped my hair off. I’ve had short hair ever since. Those of you in my boat, this is for you. We laugh about mullets and rat tails… But I can’t tell you how many I saw amongst the “older generation” on my Olivia cruise. The generation Xers among us aren’t any better! We’ve simply replaced the mullet with a Justin Bieber shag (see above). If you want this hair style, here’s what I suggest. Skip the goop completely. Go with a texturing paste like Crew fiber, or Go 247 texture cream. Keep the sides and the back buzzed short (a 0 to a 1) and leave the top around 3 inches. Apply product to the damp hair, and blow dry working from the back to the center. You don’t need every hair to stick in place. Don’t be afraid to get a little messy. This guy from High School Musical (okay, I won’t pretend I don’t know who Zac Efron is…) got it right… I did not. 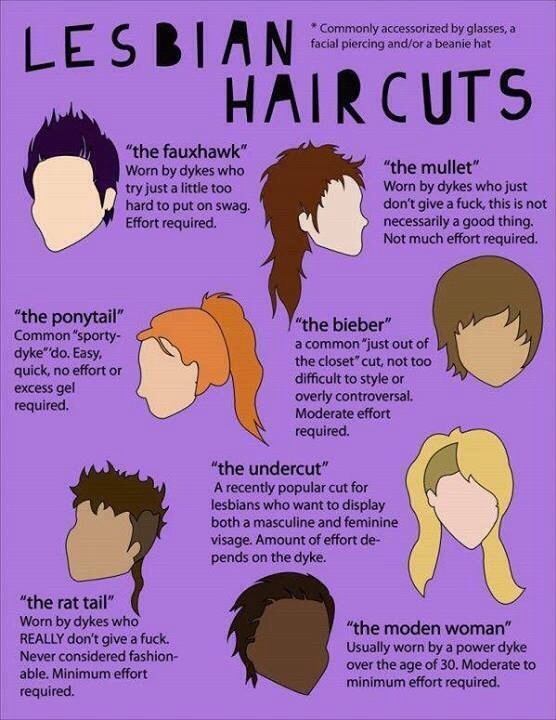 Probably the single most popular lesbian haircut in recent years has been the Bieber Shag. I personally also experimented with this one for many many years. Unfortunately, I learned that my hair is far too straight and thick for it. If you look at my friend Whitney in the picture above (sporting the Bieber Shag back in ’08) you’ll see how to do it right. I don’t think Whit did anything to her hair other than let it rage… But if you have gorgeous, wavy locks like that, you do basically nothing. If your hair is a little on the straight side, a sea salt spray like Bumble and Bumble makes can give you some extra texture for this look. But if you REALLY want to be on top of the world of hair trends, there’s one cut that everyone’s doing these days– and it’s getting a lot of attention. There are a million different names for it, but I tend to call it the pompadour. It’s classic and old school and looks good on just about everybody. Think Adam Levine, David Beckham, James Dean. It’s daring, sure. But I promise you the payoff is worth it. 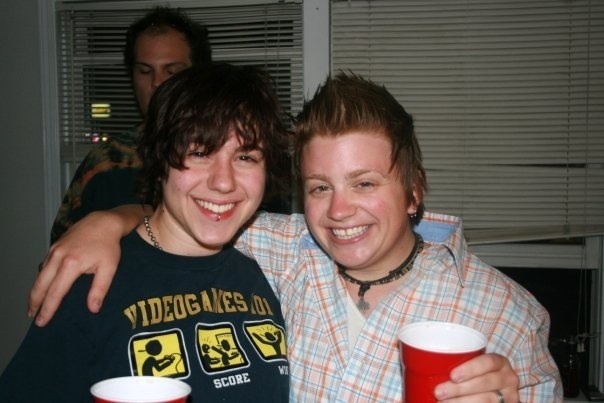 And I’m seeing more and more butches with this cut. The above is a great article from Details magazine about how to get this look. Here’s what to do: tell your stylist to go super short on the sides and back (0′-1′ guard) and work a fade in. The key is leaving enough length on top to be able to slick it back. Any hard wax or pomade works well, but I like Clean Cut by Paul Mitchell ($20). I have also been known to use Murray’s ($3) because my hair is ridiculously fickle (but be warned, a little Murray’s goes for weeks… I’ve been known to have that stuff in my hair for days on end). Use a flat brush and comb from the back, at your natural part, forward. Then, pull the front of your hair back. I like mine more centered, but you can part is to the side too. If you don’t have super thick hair like I do, you can use a blowdryer to get more lift. But I just put pomade in my damp hair and comb it where I want it. Don’t worry if it looks sketchy… Mine always does when I first do it. 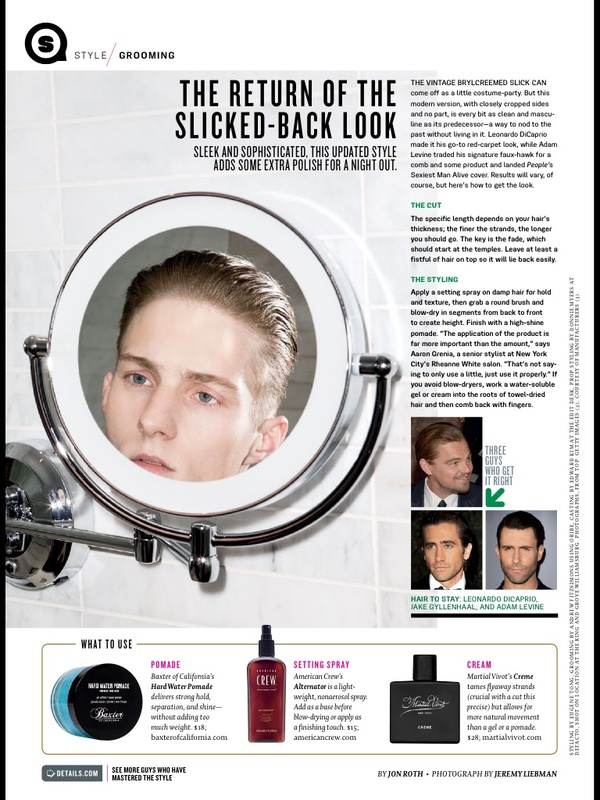 Once the pomade sets, you can reshape all day long. My barber got me to use a small hand mirror to tackle the cowlicks in the back. Just follow the hair until it lays flat. This has changed my life…. I want to leave you with one last crucial piece of advice… GO TO A BARBER!!! Seriously. I spent years going to high end salons searching for someone who could manage my hair with only moderate success. In my darkest days, I was paying a Boston stylist (who worked in a hipstery warehouse with a one word name) almost $80 to literally shave the sides and back of my head and not even touch a pair of scissors to it. The cut ended up mediocre, at best. Then, one day, Jill (my girlfriend formerly referred to as Jess– as she has since insisted I use her real name) said “why don’t you try the barbershop down the street?” A barber?! The horror! I was bombarded with flashbacks of being taken to the local old dude downtown as a kid who would take a number 3 to my head and leave me looking like Buzz from Home Alone. But hey, desperate times call for desperate measures. So I tried it…albeit hesitantly. When I walked in, I immediately noticed a shelf full of Jack Black products– and my hopes were high. They paired me with John, whose haircut I also judged just as quickly. He looked good. And when he started to talk about what I wanted, he told me he loves to keep up with men’s fashion. The best and most unexpected part of my barbershop experience was that not ONCE did John either 1. pretend I didn’t want a men’s cut, or 2. make me feel like a freak for wanting one. Long story sort of short… John gave me the best haircut ever. And for only, get this, $23… Now, I can afford to go every three weeks, which is what this cut really requires. If you want a men’s cut, get a men’s barber. They do dozens of these dos every day. Your barber will be the other most important guy in your life…along with your tailor. Big thanks to John and Richie for keeping it handsome. I like how Marceline from Adventure Time has had two of these lol.